I have it on good authority that the bid received for the Site C powerhouse, intake, spillway and penstock, or GSS contract, from the well respected and qualified firm of Peter Kiewit, was $2.6 billion as compared to the BC Hydro budget of $1.22 billion - about 100% over budget. This work is almost all above ground so there is no ready explanation for the 100% difference, e.g., there should be no need to have large contingencies for geotechnical risk. 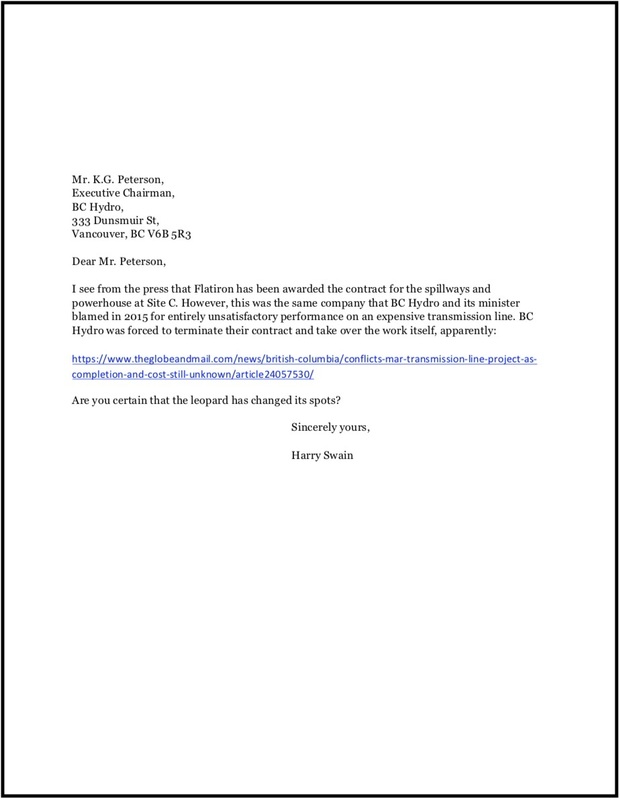 Harry Swain, Chair of the 2014 Federal/Provincial Joint Review Panel on Site C, wrote to BC Hydro Executive Chairman Mr. Kenneth G. Peterson pointing out the contractor BC Hydro ultimately selected for the aforementioned contract was to blame for "entirely unsatisfactory performance on an expensive transmission line" in 2015. BC Hydro was then forced to terminate that contract. I call on BC Hydro to release the bid amounts for all three bids for the powerhouse, spillway and intake contract. This is a matter of interest to BC ratepayers and taxpayers who will be saddled with these costs. On December 11, 2017, Premier Horgan announced his decision to continue the Site C hydro-electric dam project on the Peace River. The Site C Summit will review the rationale and the consultation/decision-making processes that led to the decision. The Peace Valley Solidarity Initiative (PVSI) has developed this website and organized the Site C Summit. This is a grass-roots initiative. The PVSI will follow with action planning and setting forth new directions in solidarity with First Nations. All are welcome who oppose the Site C project. We will proceed whether or not any members of Government attend. What did Premier Horgan mean when he said we couldn't afford to stop Site C? What does the decision mean for BC? How do we get out of this? Roll up your sleeves. This will be a working meeting. We are looking for action ideas. We want better decisions from government, transparency and accountability. What about Reconciliation? What happened to UNDRIP? Under Treaty 8, we are all Treaty People. We all have treaty obligations. To register to attend, or for more information, visit their website and Facebook event page. To bring the best case forward to save the Peace River Valley, our organization together with the Peace Valley Environment Assoc. have incurred expenses, and are now fundraising to help cover those bills. We ask you to please consider helping by making a donation. Copyright © 2018 Peace Valley Landowner Association, All rights reserved.